From the January issue of Emerging Infectious Diseases, published by the CDC (and therefore free. Must I keep urging you to read it? Go, already), here's a roundup of bad news about bad bugs. 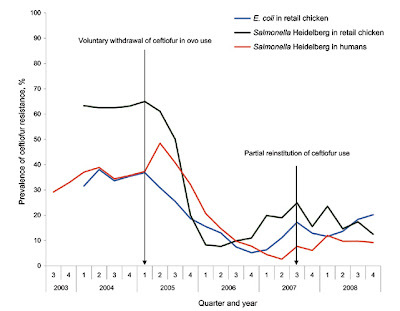 Meanwhile, broiler chickens in Iceland are passing fluoroquinolone-resistant E. coli to humans there. Researchers at the University of Iceland were puzzled by an earlier finding that bacteria resistant to fluoroquinolones (a family that includes the human drug Cipro) were increasing among chickens raised in Iceland, despite strict controls on antibiotic use in food animals and stringent disinfection in chicken batteries after cohorts of birds were sold for slaughter and removed. They have two findings: The source of the resistant bacteria in the birds appears to be feed contaminated with resistant E. coli; and resistant bacteria in Iceland residents are microbiologically indistinguishable from those in the birds. Because E. coli is a very diverse organism, the very close resemblance between the isolates from chickens and the isolates from humans pins chickens as the likely source. And just to make clear we're not blaming every microbiological evil on farming: Seagulls in Portugal have been found carrying multi-drug resistant E. coli in their feces. The public health concern here is obvious: Just think back to the last time you were at a beach, or anywhere else seagulls frequent, and envision a seagull perch — and the masses of seagull droppings streaking it. Now imagine those droppings transmitting antibiotic-resistant E. coli into the surrounding environment: the boardwalk, the beach, the towels... Additional problem: Seagulls are migratory birds, so the resistant bacteria easily cross borders and oceans. Book news: SUPERBUG available for pre-order!